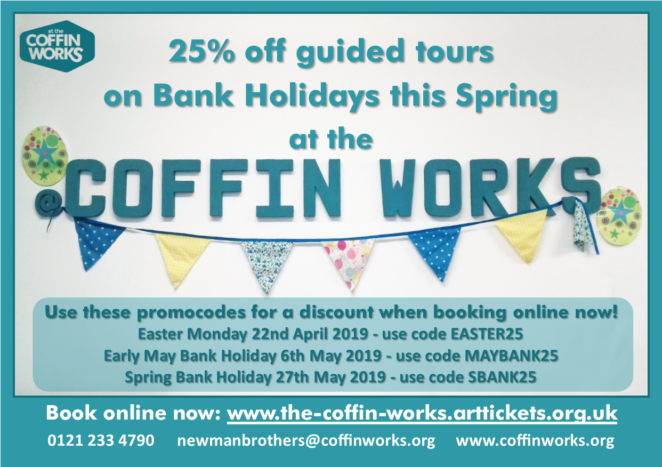 Spring Bank Holidays at the Coffin Works – 25% off! Looking for something unique to do with your Bank Holiday Monday? Then come to the Coffin Works for a tour! Our costumed guides will lead you around the museum, so you can step back in time and experience the sights, sounds and smells of factory life. If that wasn’t tempting enough, we have a special offer for those prepared folks who like to book in advance! We’ve got promocodes that entitle you to 25% off when you book through ArtTickets now.